(Tampa, FL) Alexis Yetna made more program history during his 13th double-double of the season while USF advanced to the College Basketball Invitational semifinals with a 66-57 victory over Utah Valley in Tampa Monday night. USF (21-13) now gets to host a third CBI game against Loyola Marymount Thursday at 7 p.m. at the Yuengling Center in Tampa. Yetna helped the Bulls advance by posting a game-high 18 points and 10 rebounds on a memorable night for the star forward. USF’s freshman rebounding record-holder became the fifth Bull in school history to grab at least 300 boards in a season and now ranks fourth on USF’s all-time chart with 308. The Bulls also set the school’s new single-season rebounding record with 1,322. Sophomore David Collins followed up his 31-point, seven-steal performance in the first round of the CBI with 17 points and five steals in Monday’s quarterfinal against Utah Valley (25-10). Redshirt junior Laquincy Rideau added 14 points and four steals to help extend USF’s first postseason run since 2012. Monday’s first-ever meeting between USF and Utah Valley was close at the break before the Bulls pulled away in the second half to set the school’s new season record for home wins with 16. USF used a 7-0 run to grab an eight-point advantage, but Utah Valley responded with a 7-0 run of its own to cut the Bulls’ lead to 33-32 by halftime. On top of passing the 300-rebound mark, Yetna had a perfect 15-point first half by going 6-for-6 from the field and 2-for-2 from the free throw line. Up by two after the break, Collins made two straight three-pointers and Antun Maricevic added another to spark a 16-2 run that pumped the Bulls’ lead up to 16 points with less than six minutes remaining. The Wolverines didn’t get back within single digits until the final seconds. (Tampa, FL) David Collins scored a career-high 31 points and USF erased a 25-point deficit en route to an 82-79 overtime victory over Stony Brook Wednesday evening in the opening round of the College Basketball Invitational. Alexis Yetna added 15 points and 14 rebounds to post his league-leading 12th double-double of the season, and Michael Durr finished with 13 points and four rebounds to help USF secure its first postseason victory since the 2012 NCAA Tournament. Jaron Cornish led Stony Brook with 21 points, 12 rebounds, six assists and three steals, while Akwasi Yeboah scored 19 points and Miles Latimer had 14 off the bench. Stony Brook (24-9) used a 33-6 run during the first half to build a 48-23 lead and hand the Bulls their second-largest deficit of the season. USF scored the final seven points of the half, including six from Collins (Youngstown, Ohio), to trim the Seawolves’ advantage to 18 heading into halftime. USF (20-13) opened the second half on a 22-6 run and clawed within two points on a pair of free throws from Yetna at the 9:32 mark. The Bulls would pull even with Stony Brook three more times thereafter before finally taking the lead on a basket by Laquincy Rideau with 3:15 remaining. Anthony Ochefu gave Stony Brook a 66-64 edge with 1:17 left on two free throws, but Collins answered on the other end for USF to tie the game at 66. Collins nearly ended the game in regulation seconds later after stealing the ball at midcourt, but his potential game-winning layup was reviewed and deemed after the buzzer. Collins opened overtime with a three-pointer and USF never trailed in the extra session on its way to the program’s fifth 20-win season in program history. Stony Brook got to within one point in the final minute, but USF hit five free throws over the final 24 seconds to seal the victory. USF advances to face Utah Valley in the CBI quarterfinals Monday at 7 p.m. at the Yuengling Center in Tampa. (Tampa, FL) The USF men’s basketball team has been selected to play in the 2019 College Basketball Invitational and will host Stony Brook Wednesday at 7 p.m. at the Yuengling Center. 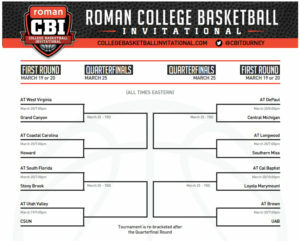 The College Basketball Invitational (CBI) is a single-elimination tournament consisting of 16 teams that compete on home courts. The championship is determined through a best two-out-of-three series format featuring the final two teams that will be broadcast live on ESPNU. The 2019 CBI field includes USF, Stony Brook, West Virginia, Grand Canyon, Coastal Carolina, Howard, Utah Valley, Cal State Northridge, DePaul, Central Michigan, Longwood, Southern Miss, Cal Baptist, Loyola Marymount, Brown and UAB. The Bulls will be competing in the postseason for the 12th time in program history and making their first appearance in the CBI. USF has made three appearances in the NCAA Tournament and eight trips to the NIT. Individually, redshirt junior Laquincy Rideau was named the 2019 AAC Defensive Player of the Year to become the first such winner in USF school history. Forward Alexis Yetna was tabbed the 2019 AAC Freshman of the Year to mark the first time USF has featured a Freshman of the Year since 1979, when the Bulls were a member of the Sun Belt Conference. Sophomore David Collin and Rideau were both named All-Conference Third Team to become the first two Bulls in AAC history to be named all-conference. Yetna was a unanimous selection to the All-Freshman Team, joining Collins as the only two Bulls in school history to be named to the AAC all-freshman team. Stony Brook (24-8, 12-4) finished in second place in the America East Conference but was upset in the quarterfinals of the conference tournament by Binghamton. The Seawolves are led by First Team All-Conference member Akwasi Yeboah, who led the team in scoring (16.6 ppg) and rebounding (7.8 rpg) during the campaign that featured wins over a Southeastern Conference opponent (South Carolina) and a pair of Atlantic 10 opponents (Rhode Island and George Washington). Stony Brook also defeated Northern Iowa, who advanced to the championship game in the Missouri Valley Conference tournament. Stony Brook also features the Sixth Man of the Year in the America East, redshirt-sophomore Andrew Garcia and the Defensive Player of the Year, sophomore Jeff Otchere. USF season ticket members will receive an email Sunday night allowing them the opportunity to keep their same seats for Wednesday’s game. Single-game tickets for the general public will go on sale Monday at noon and can be purchased at www.ticketmaster.com. All 100 level seats can be purchased for $17 and all 200 level seats will be sold for $12. USF students will receive free admission thanks to the generosity of the USF Bulls Club members. USF will also provide a live BullsVision video stream of the game on www.GoUSFBulls.com and it can be heard live on 820 AM and the Bulls Unlimited channel on iHeartRadio. USF will face UConn Thursday March 14th in the first round of the American Athletic Conference Tournament in Memphis, TN. Coach Brian Gregory talks about his team’s readiness to play in the tournament. (New Orleans, LA) Justin Brown knocked down five of the Bulls’ season-high 13 three-pointers as USF completed a season sweep of Tulane with a 75-70 victory on Wednesday night. USF (19-11, 8-9 in AAC) is one more victory away from posting the program’s fifth 20-win season after getting a career-high 20 points from Brown. The sophomore from Birmingham, Ala., made four shots from long range in his 17-point second half in a game the Bulls led from start to finish. David Collins also scored a game-high 20 points and made six of his eight total free throws in the final 1:12. Collins’ late production at the line came at an important time after Tulane (4-25, 0-17 in AAC) cut a 16-point deficit in the second half down to four in the final minute. T.J. Lang added 11 points and went 3-for-6 from long range while USF fell one three-pointer short of matching the school’s single-game record set in 1991. Alexis Yetna came close to registering his 11th double-double of the season with nine points and eight rebounds. Freshman Michael Durr grabbed a game-high 10 rebounds for the second straight outing to help the Bulls finish with a 38-31 edge on the glass. Freshman guard Xavier Castaneda totaled seven points and three assists in his third career start. It was raining threes right away in Wednesday’s action with USF making six of its first seven buckets from long range and Collins accounted for two of them. Lang joined the three-point party at the end of the flurry and his first field goal sparked a 7-0 run that extended the USF lead to 24-12 near the midpoint of the half. USF finished the first half with eight three-pointers after back-to-back buckets by Antun Maricevic and Lang down the stretch helped the Bulls take a 37-26 lead into halftime. Tulane worked a 16-point deficit in the second half down to seven with less than six minutes remaining before the Bulls heated back up. Brown sank two more threes during a 9-2 run and Lang made his third shot from downtown to pump the lead back up to 15 with 3:24 to play. The rallying Green Wave got within four in the final minute but ran out of time after Collins sank three free throws in the final 19 seconds. USF will shoot for its 20th win in the regular season finale against SMU that’s set for Sunday at 4 p.m. inside the Yuengling Center (TV: ESPNU). (Storrs, CT) USF held the lead with less than a minute to go but couldn’t secure the program’s first-ever win at UConn in a 60-58 loss before a crowd of 9,034 Gampel Pavilion on Sunday. David Collins’ two free throws gave the Bulls a 54-53 advantage with 1:04 remaining before UConn pulled ahead with a jumper 16 seconds later and made five free throws in the final 30 seconds. USF (18-11, 7-9 in AAC) erased a seven-point deficit in the second half and was seeking a season series sweep of the Huskies. UConn (14-15, 5-11 in AAC) went 20-for-27 from the free throw line overall but saw its streak of 338 straight games with a made three-pointer snapped. Collins scored a game-high 17 points and set a new career high by going 11-for-13 from the free throw line in a historic outing for the Bulls. USF set the program’s new season record for free throw attempts (808) while making 17 of 22 tries from the line. Alexis Yetna just missed his 11th double-double of the season with 15 points and eight rebounds. Michael Durr grabbed a game-high 10 rebounds to help the Bulls rule the boards by a 46-33 margin. Laquincy Rideau knocked down his second three-pointer to give the Bulls a 48-46 lead with 6:11 to play, which marked USF’s final field goal. The redshirt junior guard finished with eight points, seven rebounds, five assists and three steals. Antun Maricevic continued his hot stretch with eight points in 15 minutes. The junior forward went 4-for-7 from the field and has shot 72.7 percent in the past four games. Yetna led the Bulls with 12 points and seven rebounds in a back-and-forth first half that UConn ended up leading, 28-27. Yetna’s second layup of the game gave the Bulls their second lead, 6-5, about six minutes into the action. Threes by Rideau and Yetna sparked a 10-0 run that put USF ahead, 27-24, before the Huskies took a one-point lead into the break. USF jumped back ahead with a layup by Durr in the first minute of the second half. Down by seven, USF roared back into the lead with a 9-0 run that was capped off by Rideau’s three with 6:11 to play. Three ties followed before Christian Vital’s free throw put UConn ahead, 53-52, with 1:16 remaining. Collins’ free throws tipped the score back into USF’s favor, but Alterique Gilbert’s floater in the paint with 48 seconds remaining started a 4-0 UConn run. Two more free throws by Collins got the Bulls back within one with 28 seconds left and the sophomore had a chance to tie it with 3.5 seconds on the clock. After being fouled from beyond the arc, Collins sank two of three throws and USF couldn’t get a shot off on its final possession to at least force overtime. USF wraps up a two-game road trip at Tulane on Wednesday, March 6 at 8 p.m. Game broadcast on ESPN3. (Tampa, FL) Justin Brown scored 15 points and hit three 3-pointers in a 75-63 setback against UCF Wednesday evening at a packed Yuengling Center that drew its largest crowd since 2012 with 7,231 fans filling the arena. David Collins and Antun Maricevic each added 10 points for a USF team (18-10, 7-8) that is one win shy of tying a school record for the most home wins in a season. Tacko Fall led UCF with 18 points and five rebounds, and B.J. Taylor added 15 points and five assists. Aubrey Dawkins chipped in with 14 points and Dayon Griffin finished with 12 points off the bench. USF went on a 7-0 run late in the first half to turn a five-point deficit into a two-point advantage. Five points during the surge came from Brown, sandwiched around a three-pointer by Maricevic, as USF ahead, 28-26, with 4:37 before halftime. A layup from Taylor just before the halftime horn put the Knights ahead, 36-33, at the break. UCF (21-6, 11-4) used a 14-3 run to begin the second half, capped on a dunk by Chad Brown, to build a 50-36 lead just over six minutes into play. A three-pointer from Collins midway through the half trimmed the lead to 10, but the Knights used free throws on their next two possessions to go ahead, 60-47. USF got as close as eight points on a three-pointer from Brown with 3:52 remaining for its smallest deficit since the 17:06 mark of the half. UCF answered with two free throws from Taylor and a jumper by Dawkins to extend its lead back to 12 at 67-55. The Knights would go on to lead by as many as 15 before Brown’s third 3-pointer just before the final buzzer gave UCF its final margin of victory. The Bulls continue league play Sunday at noon when the Bulls travel to UConn for a matchup televised by CBS Sports Network. (Houston, TX) David Collins was the lone Bull in double figures as USF’s offense couldn’t heat up against one of the nation’s toughest defenses in a 71-59 setback at No. 9/8 Houston on Saturday. Collins finished with 12 points, eight rebounds and five assists while USF (18-9, 7-7 in AAC) shot 31 percent from the field against the fifth-best scoring defense in the country (60.3 ppg). Houston (26-1, 13-1 in AAC) extended its nation-leading home winning streak to 33 games and won its 11th straight outing overall. Freshman forward Michael Durr posted seven points and a game-high nine rebounds to help the Bulls finish with a 37-34 edge on the boards. Alexis Yetna added nine points and six rebounds in USF’s return to conference play after a 95-54 win over Florida College on Tuesday. T.J. Lang made two of USF’s eight threes and finished with eight points. Justin Brown and Xavier Castaneda scored seven points apiece. Collins led all scorers with eight points at the half while the Cougars took a 34-26 lead into the break after shooting 50 percent from the field. Houston made its first four shots, including three from long range, to open the game with an 11-0 advantage. USF worked a double-digit deficit all the way down to one with 5:16 remaining in the period thanks to an 8-0 run that was sparked by threes by Castaneda and Brown. Brown’s jumper with 4:04 left got the Bulls back within one before Houston closed the half on an 8-1 run. Brown made three of his first five shots and accounted for nearly half of the Bulls’ field goals in the first 20 minutes. Just like the first half, Houston started off the second off fast with a 7-0 run that was stopped by Yetna’s three with 16:34 to play. Another three by Lang got the Bulls back within 12, but that’s as close as they would get the rest of the way against The American’s top defense. USF returns to the Yuengling Center to host rival UCF on Wednesday, Feb. 27 at 7 p.m.